Missy Jay is a favorite at international events and venues around the world. The acclaimed DJ will have people up and dancing during an exclusive party at Sharm Club in Tirana, Albania. Missy Jay pumps enormous energy into each of her DJ sets. She’s received worldwide recognition for her skills that have been rated as purely exceptional by party-goers, producers and her fellow DJs. She’s won numerous awards for her advanced technical skills, dynamic performances and remixes utilizing on-the-fly improvisations, hot cues, sampling live and scratching. 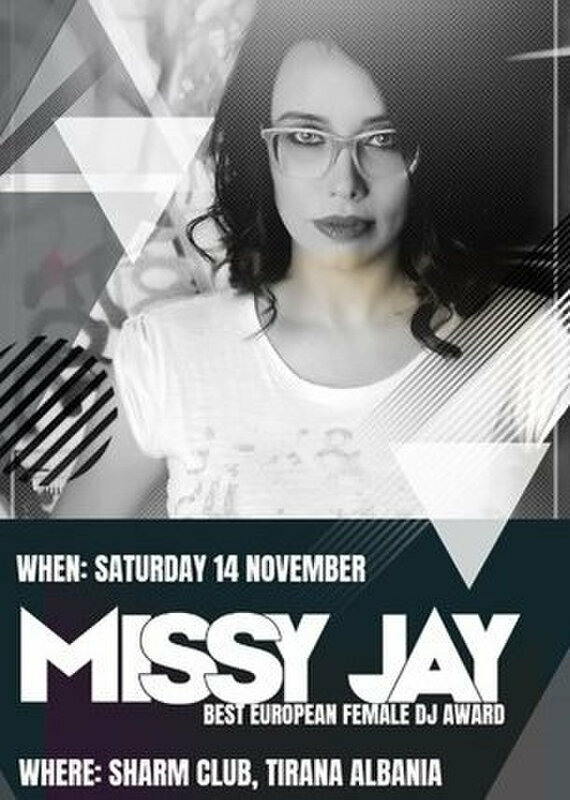 Missy Jay was awarded “Best Italian Female DJ” by the music and fashion magazine Matrix and toured throughout Italy representing the magazine following receipt of the award and also “Best European Female DJ of the Year” in France. Her innate skills have taken her around the world to gigs in the U.S. that includes the Techno Marathon and Winter Music Conference in Miami, FL and the Circus Club in Los Angeles. She’s played the Café del Mar in Brazil, clubs in Dubai, United Arab Emirates and Doha in Qatar, along with the O2 Arena in London, and the Bora Bora Beach Club and Privilege in Ibiza, Spain. She continues to travel the world performing and presiding over shows and festivals while releasing interviews for EDM blogs and influential magazines that include Matrix and Tillate. She’s been praised for her weekly Jayland radio show that’s aired on primary FM stations around the world that includes Canada, Chili, Japan, the U.S. and Spain. Missy Jay’s appearance at the Sharm Club provides individuals with a stellar event presided over by one of the most popular and well-known DJs in the business. Her electrifying performances reach her audiences on an emotional level that only the best DJs can achieve.